Would it surprise you to learn that I have not made a ton of savory pies? I do love a good quiche, but somehow I have almost never ventured into meat pies. Now that I’m writing about it, I think it’s because I prefer eating stew as stew, and in my mind meat pies = stew pies. (Also, ‘stew’ is starting to look like not-a-real-word to me now.) I totally love the idea of them, though. Maybe I just want someone else to make me one? Anyhoo, since I’m making a lot more pie these days, I think I should start adding some savory pies into our dinner rotation (she says, as if she’s the type of person who plans dinners. ha!). I think I may start with this meat and artichoke heart pie, because I will accept any excuse to eat more artichokes. And speaking of making a lot more pies, I need to go make some pie. Happy Tuesday! Tomorrow I’ll come back with more love, and pie chitterchatter (I want a synonym for this that doesn’t convey a negative value. thoughts?). For now, this pie maker is going to savor a little nightcap (chamomile tea, me’thinks) and video game time. Author RosePosted on March 14, 2011 Categories PieLeave a comment on Thank you and hurray! Hello, world! Grumpy Pie is here! We’re excited to start making you some pie, Seattle! Want to get in on this action? Buy a ticket! Once you’ve bought your ticket, follow us on Twitter or “Like” us on Facebook, and we’ll give you an extra entry into this week’s drawing. That’s right, an extra entry for something you were totally going to do anyway, right? That’s how much we love your support! We’ll be drawing for this week’s pie on Friday, March 18, about the time we finish our first cup of coffee. The chosen ones will be contacted to make delivery arrangements. We can’t wait! Author RosePosted on March 14, 2011 June 21, 2013 Categories PieLeave a comment on Grumpy Pie Is Here! If you die, and you get the choice between regular heaven, and pie heaven, choose pie heaven; it may be a trick, but if not… mmmmm pie. And then yesterday, I arrived to my day job drenched from the ridiculous March weather, and while seeking out some newspaper to help my bike-riding pants dry, found this week’s Seattle Weekly, with a huge and shiny cherry pie on the cover! Awesome! And terrifying, since this was the cover article. I was a little nervous to read it, honestly. I was worried about my competition, and nervous in general. I’ll let you read it yourself, but once I found a moment to do so, I felt a lot better. I felt bad for the companies profiled, and a little annoyed that he only profiled two of Seattle’s newer pie-specialists. I also really want to make a stop in Fremont. I think I need a pie-eating to do list. *There’s an actual, established psychological concept at work here, but I’m frankly too lazy to figure out what it’s called just now. Author RosePosted on March 10, 2011 Categories Other People's Pie4 Comments on Pie Is Everywhere! Hello, I love pie! Big surprise, I know. I think that in these contentious times, it’s important to open with a few words on Team Pie vs Team Cake. This may sound scandalous, but I refuse to take a side in the epic and needless battle that is waging between people who believe that one dessert is superior to the other. Granted, the fact that this is the blog of a Pie Maker may indicate that I prefer the crusty over the crumbly, but it’s not as simple as that. I really do love cake. Not like my friend Geraldine loves cake. Seriously, that woman’s love for cake is monumental. I don’t feel that way about cake, though I would have liked to taste the English Wedding Cake. But here’s the thing: I like pie better. I don’t really like a lot of frostings, and that tends to limit the enjoyment I get out of cake. Plus, people look at me weird when I scrape all the frosting off on to my plate before eating cake. A flaky, buttery crust, on the other hand? Yes, please! I admit that as a child I only really liked the tiny margin of crust that was soaked in filling, but no more! I think this Hyperbole and a Half is the best breakdown of why pie is my favorite, right up until she disses crust. The crust is where the magic happens! So, yeah, I guess if I have to pick a side, I’m Team Pie. Just like Mrs. O. 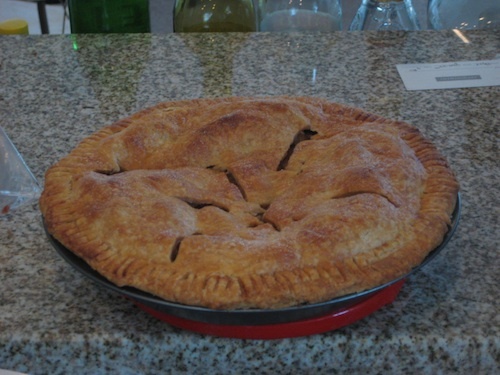 Author RosePosted on March 8, 2011 Categories not pie2 Comments on Team Pie?